I get my heart pumping at 150+ beats per minute three or four times a week in 45 minute sessions. An obvious benefit is that I generally feel fit and healthy, but that's not my main motivation: regular exercise helps keep my mental state in balance. Immediately after exercising my mind feels clearer and my mood feels more positive. This is caused by endorphin production in my body. The word "endorphin", which is short for endogenous morphine, refers to the fact that morphine-like chemicals are produced inside the body. I could obtain the pleasant mental effects by taking opiate drugs but I'd lack the the satisfaction and physical benefits that come with physical exercise. Also, it's clear that even after the endorphins have left my system, which they certainly have by the following day, that my mood and mind remain in an improved state. Another aspect is physical challenge. 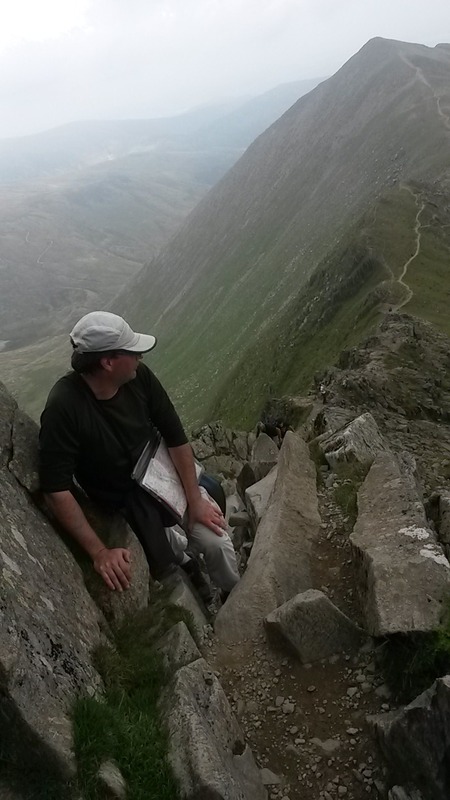 This can be pushing yourself in physical endurance to run 10 km or to cover 1 km in 5 minutes, but there's also an exhilaration in facing danger, of which there was a little when I ascended to the top of Helvellyn via a scramble up Swirral edge, as seen in the photo below. The ascent up the lower slopes was on an easy path and I was so engrossed in chatting to my friend (who took the picture) that I hadn't noticed that the terrain around me had changed. Not only would losing my footing result in a long fall, but the steepening path disappeared ahead into a pile of boulders and rocks. I wouldn't describe it as more than a clamber, and certainly no climbing equipment was required, but a level-head and sure-footedness became essential. We encountered a couple of guys who were on their way down. One was bandaging the hand of the other who had stumbled and grabbed hold of a sharp rock: better to cut your hand open than have your skull cracked like a nut after a 100 m fall. All forms of exercise have taught me much about coordination and body awareness. These aspects had an immediacy on Swirral Edge, but it is from swimming that I have learned most about them. When I started attending the local gym one of the instructors — let's call him George, because that's his name — came up to me and said he knew me from somewhere. Soon we realised that I'd taught him about spectroscopes and atomic physics at an Open University summer school five years or so before. In a nice piece of reciprocity, he then agreed to teach me how to swim. Actually, I already could swim, but my front crawl technique was so inefficient that I could barely swim a couple of lengths without being hopelessly out of breath. George taught me how to position my body in the water. He approached it in two ways. First, he drew my attention to the physics: to swim efficiently you must minimise friction and reduce the surface area you present in the direction of motion. This means that your body should be horizontal in the water with your legs kept just below the surface. Second, he instructed me on how to achieve this: I had to keep my head beneath the water. It's hard, if not impossible, to keep yourself horizontal in the water by consciously trying to lift your legs. Any attempt to do so results in strange contortions involving the hips and torso that can't last for more than a couple of strokes. Pushing my head beneath the water however did pivot my body about my centre of mass thus making it natural to keep my feet high. It took a bit of practice, especially in timing my breaths, but keeping horizontal turned out to be most of the battle in learning to swim efficiently. Next time your at a pool, watch the swimmers. Ones with poor technique, whether front crawl or breast stroke, will have their head out of the water and legs dangling down behind them. They'll either move very slowly or be unable to swim more than a length or two at a time. Watching people getting it wrong needn't involve smug gloating, but can really help understand one's own mistakes. The other thing I learned is that leg kicking is in itself an inefficient way to propel yourself through the water. The hefty muscles in thighs and calves are good at moving legs up and down in the presence of gravity on land, but will quickly drain your energy if used too vigorously in the water. For an efficient front crawl you must use your arms to pull yourself forward whilst keeping the legs fairly straight and moving mostly to balance the rocking generated by your upper-body movements. The above descriptions make the learning process sound more conscious than it actually was. I learned an efficient front crawl through practice and it took hundreds of lengths before it became instinctive. At times, when the rhythm is right, I feel like I'm flying, and there have been moments where I felt that I'm more at home under the water. Is this me tapping into some deep primal instinct rooted in an evolutionary ancient part of my brain? What's clear to me is that body and mind are entwined and that improvement of one is limited by the state of the other. Certainly, one can have a flabby mind and a fit body, or vice versa, but I feel it's best to invest time in improving both.